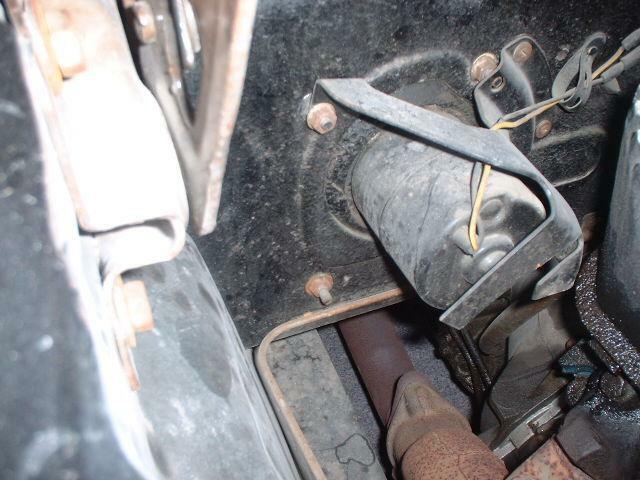 Due to the size of FE-series engines and the close confines of the Mustang engine compartment, Ford found it necessary to mount a shield to protect the heater blower motor (for cars without air conditioning) or the air conditioning expansion valve (for cars with air conditioning) during engine and transmission installation on Mustangs equipped with a 390, 428 CJ, or 428 SCJ engine. This shield is made from stamped steel and is typically painted the same semi-gloss black as the firewall itself. I've never seen a shield that includes any sort of stamped or cast identifying numbers, but the 1968 Osborn electrical assembly manual describes the shield using an engineering number of C7ZA-19C842-A (on a page dated 17 January 1968, superseding a page dated 9 October 1967) and the 1970 Osborn electrical assembly manual (on a page dated 12 November 1969) describes the shield using an engineering number of C9ZA-19C842-B. These manuals are published by Jim Osborn Reproductions and are available from most Mustang parts vendors. Thanks to Steven Altmann for sharing information he noted in the 1968 Osborn assembly manual. "AFTER ENGINE DECKING IS COMPLETE AND BEFORE STARTING ENGINE, REMOVE SHIELD & REPLACE EXISTING SCREWS (ITEM-13)"
This seems to imply that the shield was supposed to be removed by a line worker after the engine and transmission were installed, with the worker reinstalling the screws used to secure the shield. Perhaps Ford accountants wanted the shield re-used to reduce assembly costs. I suspect, though, that a great many of these shields were left in place instead of being removed due to the time and energy required to remove it once the engine was installed and space was reduced to near nothing. 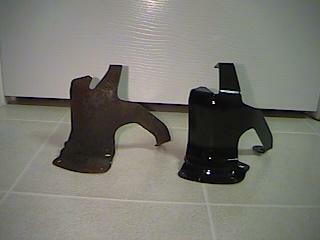 Top view of firewall shields. 1969 – 1970 version at left, 1967 – 1968 version at right. Here's the confusing part: both of the assembly manuals illustrate a part that looks like the shield show above on the left. While these two shields initially appear quite similar, note the differences circled above. 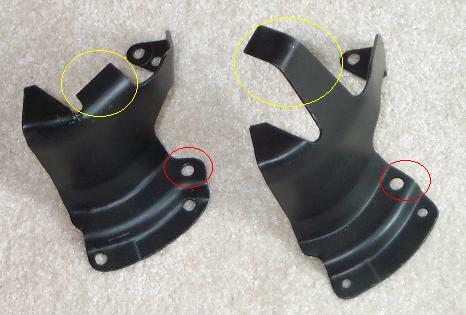 The mounting surface and holes (circled in red) are slightly different, and the version on the right includes a long "finger" to extend over the bottom of the heater blower motor (circled in yellow). This finger is absent on the version to the left. The C7ZA-A shield is listed in the 1968 MPC (with a part number of C7ZZ-19C842-A) as being correct for 1968 428 CJs, but it's also listed for 1967 390s and 1968 427s. 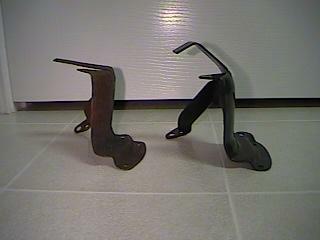 Two different parts were used during the 1969 model year: C9ZA-19C842-A for 1969 390s, and C9ZA-19C842-B for 1969 428 CJs. I've also seen pictures of a third style shield that has a long, flat finger, which appears to be some sort of hybrid of the first two styles. Two pictures showing a comparison of this shield to the heater motor shield are provided below. 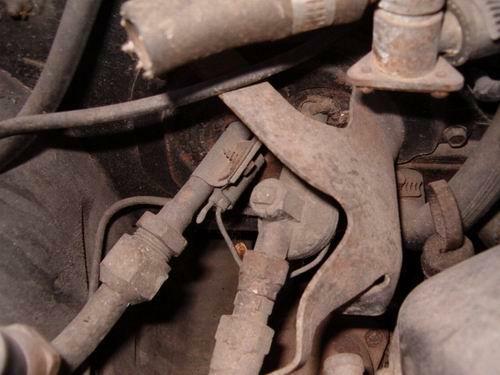 At this point it appears that Ford tended to use whatever they had on hand when it came to installing and removing these shields. My personal recommendation is to use the long-fingered style if you want to use a shield and you don't have air conditioning. Use the no-finger style if you have air conditioning. Don't use one at all if you don't want one, and tell any judge that complains that the assembly manuals clearly state that they should have been removed after the engine was installed!